Arpaio deserved a pardon, said Cheryl Chumley in WashingtonTimes.com, because his prosecution was a “political hit job” from the outset. The Obama Justice Department filed charges against Arpaio just two weeks before he was up for re-election, and the judge in his case—a Clinton appointee—refused his request for a jury trial. Why? 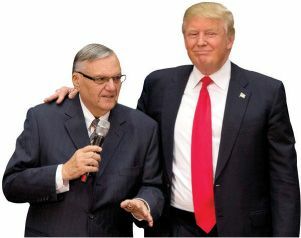 Because Arpaio is loved in Maricopa County, and “a trial by his peers likely would have seen him cleared of all charges.” All Trump has done is bring “a political end to a political case,” said Paul Mirengoff in PowerLineBlog.com. The left-wing Obama administration prosecuted Arpaio to discourage vigorous enforcement of our immigration laws. By pardoning Arpaio, Trump is signaling that he’s committed to the “tough-asnails immigration policy” that got him elected.